So Sam Adams and Brickell Fest are throwing a party on October 5th and 6th from 4 pm until midnight each day. Why you ask? 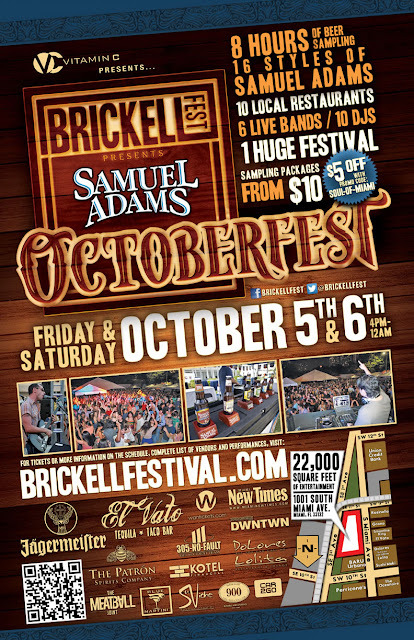 To celebrate Octoberfest over some awesome beers, music and food. There will be 16 different Sam Adams beers available, including the awesome Utopias. Looking at the list, I'm going to say that after Utopias, I find their Noble Pils and Boston Lager among my favorites, and I'm looking forward to trying Hazel Brown and their Angry Orchard cider line. Anyway, I'll be there Saturday evening drinking beer and signing autographs until they ask me to stop. But you can ask later in the parking lot if you want too. There will also be spirits floating around. No not that kind. Jagermeister and Patron Spirits! I'm thinking everyone will find a beer or cider they like first though. If you leave a comment here, you also win... well... nothing. But we can grab a beer at the festival. OK?